This villa is simply stunning. It benefits from a secluded position in the north east tip of Samui, yet is conveniently situated close to the airport and major tourist attractions, making it ideal for groups looking for a touch of luxury but wanting to maintain a level of seclusion. Accommodation comprises: 4 en-suite bedrooms all with air conditioning: Large open-plan lounge with views across the infinity edge pool to the bay beyond: 2nd lounge and TV room in downstairs apartment: Fully fitted European kitchen with granite work surfaces: Sun terrace and sala with separate fridge, shower, wc and outdoor dining area. The villa benefits from 24 hour security and ease of access with ample parking provision. It benefits from "passive cooling" in the living and kitchen areas to keep cool without using air-conditioning. The west facing aspect of this villa overlooking the Gulf of Siam towards the Ang Thong Marine Park provides some of the most spectacular sunsets on the island. We are a family of four and we live in England with our various pets. My wife and I both work, but have spent most of our holidays over the last few years in various parts of Asia. We especially love Samui, where we have made many friends and have really fallen in love with it and the surrounding islands. It's hard not to fall in love with Samui and the surrounding islands like Koh Phan-Ngan and Koh Tao. They really are a tropical island paradise. We decided to take the plunge in 2006 and bought a little slice of hillside jungle overlooking Big Buddha beach and out towards the Marine Park. The building was finally completed at the end of 2008. 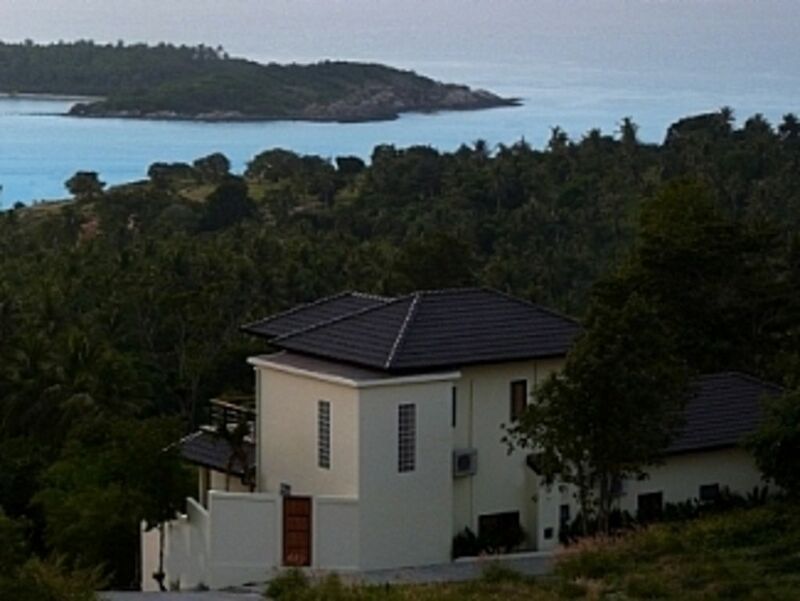 Because the villa is in a secluded spot on the headland, there is no through traffic. It really is a tranquil, secluded spot. Yet within minutes you can be in the hustle and bustle of Chaweng or strolling through Fisherman's Market. Hopefully the photo's on this site and on our website will give you a good idea of the villa and setting it is in. None of them are taken by professionals or doctored in any way...just me and my camera, to be fair it's impossible to do the views justice with a camera and my skills, I hope they give you a little taste of what the villa and Samui are like. All bathrooms are en-suite. The master suite bathroom benefits from his and hers basins set in teak and views over the bay from the shower. All bathrooms are finished to the highest standards. Changed by the maid every 3 days. We provide one pool/beach towel and one bath towel per guest. Large lounge area with seating for 8 plus. Luxurious sofa and chairs. 50" plasma TV with UBC satellite and DVD surround sound. Audio system with MP3 input. All glass walls to benefit from the spectacular views. 2nd downstairs lounge area in apartment. American style double fridge freezer. Fridges also in the master bedroom, the sala and the downstairs apartment. There are two Nespresso coffee pod machines at the villa. Bring your favourite pods with you. Breakfast bar can seat six. Sala area can accommodate up to 10 people around the dining table. Satellite tv in the main living area. Numerous western channels. Guests are welcome to help themselves to the book library. Please feel free to leave the books you have read on holiday for other guests to use. Several board and card games available for guests use. Bring your own personal player. The living room system will accept any 3.5 mm input. Sony PS3 system in the downstairs apartment. TV here also can accept DVD's to watch films. Amazing sunset views from the master bedroom balcony as well as from the infinity pool. Coffee table and chairs for casual dining. Double sunlounger day bed. Our friends offer Stand Up Paddle board classes. Please ask for details. The 18 hole championship Santiburi golf course is a 20 minute drive away. Bophut hills golf course is 10 minutes away. We have four full sets of golf clubs at the villa for guests to use. Just bring your golf shoes and ask the villa manager to provide the clubs when you need them. The two ground floor bedrooms can accommodate wheelchair access easily. The upstairs master bedroom suite and downstairs apartment are not suitable for wheelchair access or those with mobility impairments as the stairs are steep. The pool has two shallow areas which will help those suffering from any mobility impairments to enter and leave the pool, similarly this will help those with small children, but as with all pools, guests are reminded to supervise children in the pool at all times. Private pool. Views from the infinity edge pool over the bay. The Villa is exactly as described by Ann. The view down to Buddha Beach is breathraking. The area is calm and secure within a dozen of exclusive houses and Appartments. The airport is nearby, but since there are not many starts and landings, it was for us not a problem. The house is very well maintained. Many well thought through details and the equipment of the house shows, that it was constructed for an owner who expects very high standards. The house is spacious and provides 3 comfortable bed rooms with luxurious bath rooms en suite. We were 6 people and everyone of us had his private space, since the house is pretty large and there is a nice sala with views down to the bay. The pool is large, very clean and offers great west wards sunset views without any obstacles in front. The house is managed by a very caring lady who lives also within the gated community and the owner Aen is responding at any time and did everything to make our stay as comfortable as possible. Overall I can HIGHLY RECOMMEND this house. Please consider that you need a car, but Aen can also help you well with that topic. Where do you start - ideal location, fantastic property - beautifully decorated and spotlessly clean. The owner arranged our car hire which was waiting for us on arrival at the airport, 10 minutes later we arrived at the villa and were met by the local manager. The villa has everything you need and is perfect as a relaxing getaway comfortably sleeping 6 in the main villa, with space for more in the additional apartment downstairs. Pool is big enough for a good swim as well as to cool down in and an ideal spot to watch the sun set in the evening. We had a nice stay at the villa. The owner supported us at any time, really nice contact. The division of the house is really good. There are seperated rooms with different sizes on three different levels. The pool is big enough for swimming and the area outside is generously built, really good for making BBQs (new grill). Especially the View is unique! We highly can recommend the villa. The villa overlooks Big Buddha beach which is a 5 minute walk. Other nearby beaches are Tongson bay 4 mins drive. Samrong bay 2 mins drive and Cheong Mon beach 7 mins drive which is regarded by many as the best on the island. Beaches slightly further afield are Chaweng 15 mins. Bophut 12 mins and Mae Nam 20 mins. No beach on the island is further than 45 mins drive away! Being an island, you are never more than a few minutes away from any beach on Samui. Samui airport is 10 minutes drive from the villa. Car hire is not essential, but is highly recommended. We can arrange car hire if required. Tesco Lotus supermarket 20 mins. Cinema 20 mins. Bowling 20 mins. Choeng Mon beach 7 mins. Chaweng 15 mins. Bophut (Fisherman's village) 12 mins. The activities available to visitors to Samui are many and varied, popular activities include golf, diving, sailing, snorkelling, wind surfing, kite boarding, flying fox, atvs, elephant rides, jet skis, cooking, spa treatments etc etc. We can advise from our experience where to go and who to contact. When it comes to dining out, the list is endless, let us know your tastes and we can advise. Booking Notes: When booking we require an initial deposit of 40% direct credit to our account. The balance to be paid 8 weeks before arrival. If the booking is made within 8 weeks of arrival, the total cost of the rental shall be due at the time of booking. During peak season the minimum stay is 7 nights. Payment via bank transfer and by PaypPal also accepted. Changeover Day: Changeover days are flexible Notes on prices: Prices are for the property per day/week in UK Pounds. Contact the owners for deals on longer lets. Electricity is also chargeable. It is charged at 6THB per KwH. Meter reading is done with villa manager on arrival and on departure.